One of the greatest playback singers in Bollywood history, Asha Bhosle completed her golden jubilee in the Indian film industry in 1994 with over 11,000 songs to her credit – making her the singer with the highest number of recordings in the world. 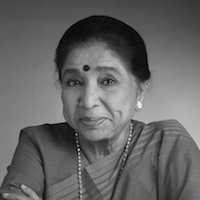 During a distinguished career in music spanning over six decades, Asha has staged concerts across the globe and enjoyed critical and commercial success collaborating with celebrated artists, including classical composer Ali Akbar Khan, vocalist Shujaat Khan, the Kronos Quartet and keyboard player and vocalist Adnan Sami. The first Indian singer to be nominated for a Grammy Award, Asha has won several major accolades throughout her career, including nine Filmfare Awards, two National Awards from the Indian Government, and two MTV Viewers Choice Awards among many others. "Demonstrating an exemplary work ethic throughout her career, Asha Bhosle once performed in 13 US cities in 20 days on one of her world tours before performing a sold-out concert in Stockholm immediately afterwards. As an artist, Asha has an uncanny knack for making every actress for whom she sung, from Zeenat Aman to Urmila Matondkar, smolder on screen as never before – and nearly six decades after her foray into the world of music, Asha continues to rock, constantly reinventing herself musically and through tangential career choices."